New glasses, a new outlook, and a wide open space. Happy New Glasses Day! On our way to celebrate with ice cream. I'm clearly enjoying my three-dollar vanity frames and colorful, American, toddler-girl version of Harry Potter. Apologies for my last boring update. I felt obligated to ramble through our ophthalmology appointment. More of a Lord of the Rings style saga than a mere appointment. That said, writing it all out helped me put the many little oddly shaped pieces together. A couple of weeks later, we went to Alderwood Vision Therapy Center for Stella’s progress evaluation, to get the input and opinion of Stella’s developmental optometrist, Dr. T, who oversees her vision therapy. We’d forwarded Stella’s records from Children’s ophthalmology department beforehand. Today, Stella has fabulous new glasses, with the same old prescription. While her ophthalmologist told us to up the prescription, including accommodation of slightly increased astigmatism in one eye, Dr. T advised against it–in line with my questions and reservations. Stella’s alignment is perfect and her acuity still great (both eyes 20/20 up close, less than a line difference at far) with the current, lower prescription. So why encourage further farsightedness and astigmatism with automatically amped-up prescriptions when she’s doing so well as is? As always, I pay attention to how Stella and her eyes are doing. If Stella shows the need for an increased prescription, we will rush out and secure it for her. But not until then. We have decided to continue with vision therapy for a while, in an effort to amp up that left eye a bit more and solidify her vast gains. Treatment usually runs for nine to 12 months, and we’ve actually only done about eight by now (with a few weeks missed, so really about seven months actually completed). I’ve had this hunch about Stella’s vision: Now that her peripheral vision has opened up, her eyes are in a better position to work together optimally, and just as importantly, she’s more open to the world, including vision therapy. 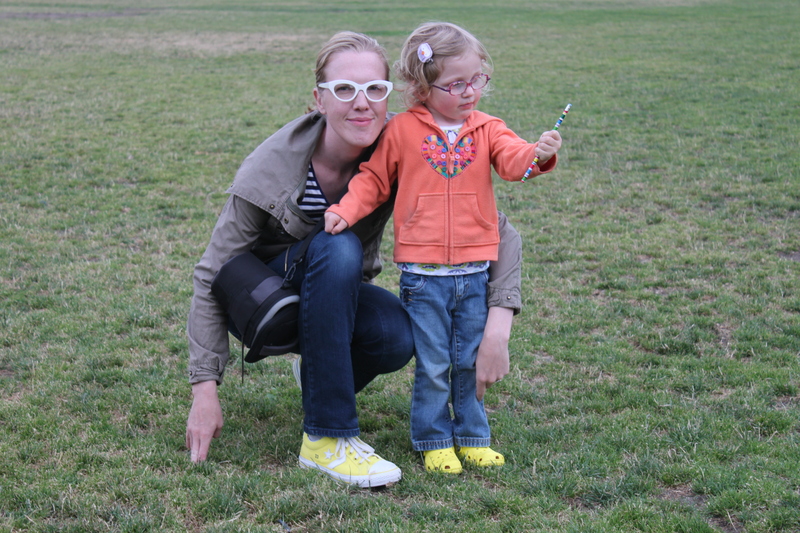 Stella’s vision therapist, Bethanie, is now on maternity leave. Though a quick hug was the only sign of it, I felt the moment was an emotional, if only temporary, goodbye. Bethanie saw us at our worst, and helped bring out our best–mainly for Stella but also for me. It’s a credit to her, really, that Stella’s degree of openness has changed so dramatically that switching to a new therapist during Bethanie’s leave has been no big deal at all. I’m incredulous when I think back to Stella’s early days of mute and reluctant vision therapy sessions. (Okay, and desk-clearing outbursts.) Sure, Stella threw a tantrum today at the outset of our vision therapy appointment with Mandi, but I think it’s because I abruptly took away the giant stuffed dog she was cuddling as we waited. Regardless of the reason, she turned it around two minutes later and sailed on through. By the end, I had to coax her to make an exit. As I discussed with Mandi today, Stella uses her eyes together–she performs successfully with the quoits vectogram exercise. She can now catch a ball thrown to her. While just months ago she flat-out refused to look up and catch a slow-floating balloon, she now bats one around to herself, or plays catch with one, unprompted and just for kicks. Her toe-walking is now a fraction of what it was. The yoked prism goggles are now comfortable for her to wear, whether base up or base down, whereas getting her to wear them at all was once a Herculean task of mass distraction. She can see a new world in her periphery. There are too many good signs to list. Frankly, you can tell how well (or poorly) we’re doing by my appearance. I accessorize and wear skirts a lot more now. I can’t let Stella’s bouncy curls and chic glasses completely steal the show! Though, they always do. Stella collects compliments the way I collect freckles, and awkward silences. Yesterday, Stella enjoyed her first independent gymnastics class. It felt like a big shift, after a couple years of “mommy and me” classes (some of them only marginally tolerable to me, and many times her!) covering music, swimming, Gymboree, and her previous gymnastics class at the same academy where she’s now enrolled. For the first time, I was not at her side but watching from distant bleachers at the edge of the vast facility. She took to her teacher right away, holding her hand several times. She sat with her classmates on the balance beam, following the teacher’s motions and kicking her feet in that carefree, unselfconscious way little kids do when they’re content. She smiled a lot. Her eyes were wide open, taking it all in. She drifted away from the class about three times, tempted by the rings, the rope swing over the foam pit (which they were able to gain access to), and to proactively re-arrange the colorful floppy stars on the ground that marked the route of an obstacle course. But I also saw that straying as positive, and part of the process. She is confident to explore, yet she’s also responsive to her teacher and learning to stay with the group. And this was just her first class! A couple of other kids’ parents stayed with them through most if not all of the class, but I simply was not needed. If she’d needed me, it would’ve been fine, and frankly, expected as part of the adjustment. The fact that she dove right in, though… that was hugely telling to me. Completely reaffirming. Backing up a tad. She missed the actual first class, because I locked the keys in the car. So instead, we went for a walk and I’d planned to cringe inwardly the entire time because I felt like a complete failure, having talked about the class and built excitement about it and, well, paid for the series of eight classes for which no make-up sessions are available. At the outset of our stroll, I was holding her with both arms, in front of me. Stella started beaming suddenly. Then she looked directly into my eyes, with a twinkle in hers, and a hint of laughter in her voice, “I like you, Mommy.” Instantly, my guilt went away and I grew about two inches taller. In short, during the first class, which should’ve been the second class, Stella was completely unfazed by my absence. Thrilled, even, to be out there embarking on an adventure as a “big girl.” I was so proud and delighted I could float. Unbelievably, I was completely, 100% relaxed. Stella was, too. Then, midway through the 45-minute class, I felt the searing of emotion in my throat, and tears welling up, briefly. It dawned on me how central I’d been to Stella’s comfort and wellbeing for so long. In the usual motherly way, of course. But also in getting her through some trials: Helping her overcome her feeding aversion which entailed an extremely obsessive effort to figure out what was wrong, then pinpointing the perfect position and timing and planetary alignment in order to ensure that she’d eat, and so it seemed only I held the key and only I knew that we needed to do to get rid of her feeding tube which had become the main problem and it all felt very much like her health and development were going to be flushed down the toilet if I was not hyper-vigilant at all times and when I pondered the situation there were no periods (or sleep) between thoughts, just a few commas in a continuous run-on sentence of anxiety that would not end for several months. Not long after, her eyes crossed severely, after likely having been slightly misaligned all along, and my new task was to address her vision issues and the toe-walking and tunnel vision and accompanying anxiety they created for her. I had the sense that my presence, my being in perfect tune with Stella, was critically important on many levels. Me, me, me, I, I, I! I was very, very important, you see, because Stella needed me all the time. But it’s become clear that she’s on the other side now, having gathered all the wisdom that three years on the planet yields, and emerged from her challenges triumphantly with only some fine-tuning that remains for her eyes. So, yesterday in that expansive, wide-open gym, I relished the opportunity to sit back, and watch her be the happy, well-adjusted child she has become. She looked over at me a couple of times, excitedly telling me something I couldn’t hear from such a distance. But I could feel it. And it was downright miraculous. P.S. It’s clear that Stella prefers wide open spaces. 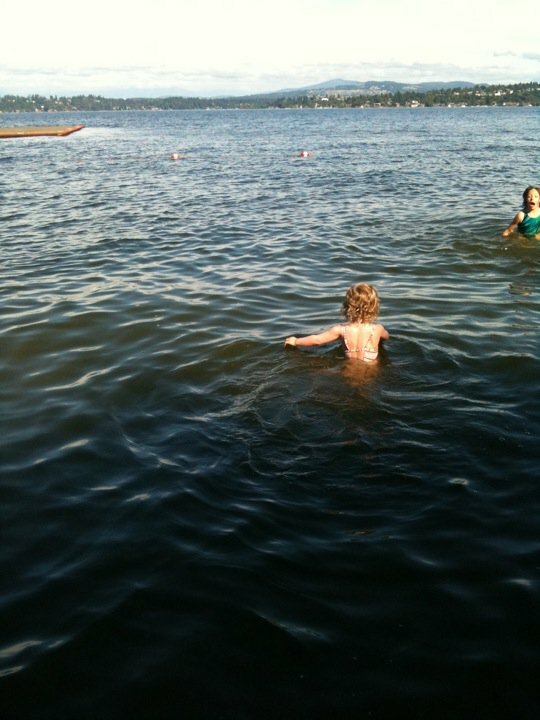 Yesterday afternoon, as is typical, she tried to walk out into the middle of frigid Lake Washington. “Adventurous” is now one of the top adjectives used, by friends and strangers alike, to describe Stella. And that’s the truth, Ruth. 5 Responses to New glasses, a new outlook, and a wide open space. Rejoicing with you! and so thankful you are blogging this journey to help inform other parents who only want the best start for their kids. Life is now a dance for Stella. Hooray! New parenting challenges await, but more in tune with setting boundaries now that Stella’s opportunities are boundless. Parenting never ends. Why, just the other day my husband’s 91 year old mom reminded him to wear a life preserver and confessed to worrying about him, should he go sailing this summer. My husband will be 60 in October! What an amazing journey you two have been on, Amber. Weird, knotty problems like feeding and choosing among therapies, carrying out a disciplined program, being so alert all the time……and making it to the other side!!! Just think if you hadn’t done all that….. Stella is lucky and it is beautiful to hear of her many changes and ever-increasing love of life. I love this, Amber! You’re such a good mother for Stella. I’m so glad she’s so clearly thriving in so many ways! This is great! I mostly keep up with Stella on FB but I’m glad I came to the blog and read the full story. Congratulations. Stella is wonderful, and so are you!